kandeej.com: Fall Make-Up on my mom! Get ready to add some dazzle to your fall make-up! Instead of all the FALL/AUTUMN "trends"...which are always so predictable....browns, golds, blah.....I wanted to show you how to add some color to typical "brown-neutral" shades of fall! And have some pink with pink that's bold!!! This is a very fun and funny video(watch the end for the funny parts with my mom)! CREAM CHEEK COLOR~I used a bright pink cream cheek color (to add a youthful glow to my mom's face) in POSEY from MAC...and hot pink cream color or even a hot pink lipstick will work! I used a neutral shadow - use ANY shade that matches your skin, for my mom I used BRULEE from MAC. I used Black Black (it's a pro color from MAC or you can use any cream/gel black liner) and an angled brush. I also really like AQUA BLACK from Make-Up Forever that is totally water-proof! I went over it with black eyeshadow to soften the edge, in CARBON from MAC. I used a HOT PINK lipliner from Make-Up Forever in 16C FUSCHIA to apply a "stain" for the pink base. Then I went over the edges in CHERRY RED from MAC. And topped it off with a HOT PINK BLUSH to set the lipstick and give it a velvety-matte look. I used HOT PINK blush, any brand will work, from MAC. I ALSO dabbed ANGEL (a light baby pink blush) in the center of the lips to make them look bigger! So don't be boring this fall with browns, add some punch and fun with this fun look! Get ready to watch this fun and funny video! Make sure you watch the end! This look is great!!! You're Mom is gorgeous!!! You should do some make-up looks on your sister!! Haha she is so funny and cute! wow!! she's beautiful, your mother look like your sister!! she is gorgeous and the make up is fabulous!! congrats! You guys look so similar! Gorgeous ladies in your family. I love your laughs - You and mama have the same laugh, it's too cute! you guys can be TWINS kandee !!! you and yur mom could pass as twins you all are soo beautiful!!!!! I love the realationship that you have with your mom. My mom and I are the same way. When I was little we used to make faces in the mirror and see if we looked the same cause we look so much alike. Its fun being best friends with your mama. And she looks absolutly stunning! As are you miss Kandee! She looks great with a bright lip! your mom looks fantastic and i can't believe how much you two look alike :p you've got some good genes there!! Your mom is stunning !!!!! thanks so much guys...I think you all made my mom's whole year with all the compliments...she can't believe it! huge love from me and my mama!!! You did such an amazing job. Your mom looks absolutely GORGEOUS!! My mom & I have a very rough relationship so when I traveled back home last time I did her make-up. She doesn't wear hardly anything normally. She looked so pretty & when she went to a big work event she had after wards 3 people asked her if she had had her make-up professionally done! More importantly, she felt really good about herself and it was a really good bonding time for us. We really needed that. I'm going back for Christmas so I for sure plan to use these tips and do it again! i love the look, i too will need to make a little list of items i want. i wish i had the liners to do my lip like that right now, next purchase! You look so much like her!!! beautiful! I absolutely LOVE that you do makeovers on your mom, I do the same thing. Since I've started my beauty blog (www.publicservicebeauty.com), she's asked me to come over and re-create any looks I do in the blog. It's the easiest route to mother-daughter bonding, especially when you're grown up and not living together. As always, your mama looks gorgeous, with and without the makeup tricks!! your mom is gorgeous!! you guys look so much a like! the video was adorable i loved it! I just cannot ever get over how much you guys look alike. Well, duh, cause she's your mom, but even I don't look that much like my mom. Both of you are beautiful! Question: In the previous post, you mention Crown Brushes. What is good about them? I'm always looking for new brushes, and sometimes it can get expensive at Ulta, even, with their brushes. These Crown ones look like they're a good price. You obviously like to use them. Your mom is gorgeous.She is so so so beautifull!!! I am sad for those who dont have a good mother..
Kandee, your mum is so beautiful inside and outside. She's been a great example for You beautiful. Your mom looks so amazing!! i love the pin up look on her, and it makes her look even younger!! I'm looking forward to more make up looks from you!! 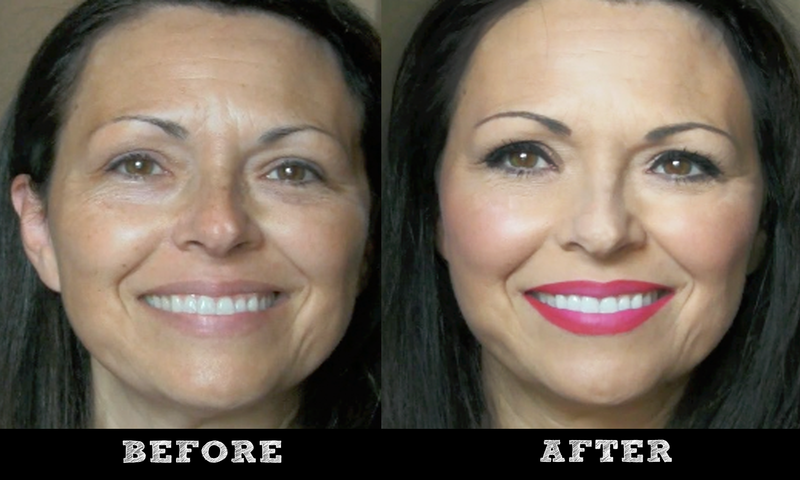 Hey Kandee, I love your mom lips color It Looks wowowowonderful! Funny video, I love your mom´s make-up!It´s very beautiful. totally appreciate all your videos, i am new to wearing eye makeup and you have been super helpful. well mac has some cool brush sets for about $50 and i am curious, what brushes are essential? you use a fluffy brush for all over color and a flat one for your liner, what are those numbers? OMG! You look just like your mom! So BEAUTIFUL! =D I love her makeup!